If you like fruitcake but don’t have the patience to make it, these bourbon cookies packed with candied fruit are a great substitute. Bourbon lovers will appreciate the flavor, which isn’t subtle. If you are interested in the cookies but not quite sure how they’ll be received, the recipe halves well. 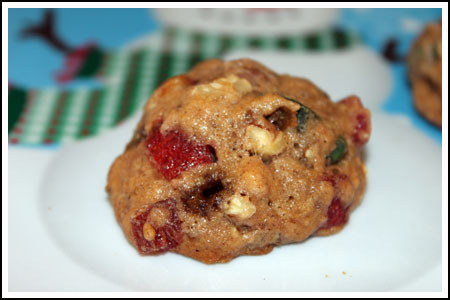 Candied Fruit & Bourbon Cookies are like miniature versions of fruitcake with a good bourbon flavor. Mix the candied fruit and raisins in a bowl, then pour in the Bourbon and stir to coat fruit. Cover and let sit overnight at room temperature. Preheat oven to 325 degrees F. Line a couple of baking sheets with parchment or grease well. Mix the flour, salt, cinnamon, cloves and both sugars in a large mixing bowl. Add the beaten eggs, cooled melted butter, and baking soda/water mixture to flour mixture and stir until ingredients are mixed. Add the soaked fruit and nuts and stir until blended. Scoop batter up by generously heaping teaspoonfuls and place a couple of inches apart on baking sheets – the cookies puff up, but they don’t spread too much. Bake for 15-18 minutes. Remove from cookie sheets and let cool. Store covered and let the Bourbon flavor mellow. Christmas Cookies from Big Baking Talent! I just finished these cookies and I think once they set for a week they will be very good. Actually, they aren’t bad right out of the oven. I was given some candied fruit and searched until I found this recipe. The cookies are easy to make and if you have a stand mixer it is no trouble at all mixing the ingredients. Gavin, I think these would do pretty well. I’ve never mailed them, but they do keep well. These look pretty amazing. I was curious, would these travel well in the mail? I am always looking for things that can go be mailed to others. Well, it depends on the recipe. For instance, this recipe isn’t one where you’d bother with a substitute because Bourbon is the highlight. If recipes call for small amounts of booze — like 1/4 cup, then you might swap out another liquid that has a flavor you like. Of course the easiest thing to do it just go with a different recipe. There are so many to choose from which do NOT have alcohol. Hi there! I saw your page when i was google-ing and thought that i might as well try some of the recipes. They were great! However, I do have a small question especially in regards to this recipe. You see, I don’t consume alcohol. Some of your recipes used them. how can I substitute them? I’m glad you liked the cookies! This was my first time making the recipe too. Maybe on the second try, I’ll add more bourbon. If you splashing a little bourbon over the baked cookies, let me know. I think that might work, but I’m not sure because the cookies are aleady pretty moist. Anna, I just made these and they look good. When I put the bourbon in the fruit it really smelled, but after they are cooked I don’t taste the bourbon. Maybe after a day or two they will taste more. They are good, though. I was thinking of giving them a little shot like fruit cake! The recipe was very easy to make but when I was mixing the fruit and nuts in the batter was quite thick. So I put on my gloves (the ones you get with hair coloring are just right for working with dough) and worked the batter with my hands. They don’t spread at all. Its a good recipe – thank you. These look so good I dashed right out and got the fruit and some 80 proof bourbon. They didn’t have 100 proof so I had to settle. I was tempted to use Southern Comfort – its a little sweeter, but I think the first time one should follow the directions. Would Louise mind sharing her mini-fruitcake recipe? I have the pans and would like to try some. This sounds like a much updated take on fruit cake. I admit it! I like candied fruit! I don’t drink but I like fruitcake–I might use another beverage but these look like a great way to have the taste of fruitcake without the long ‘marinating’ period, and not quite so heavy. Ooooo my kind of cookie! I hope the food bloggers like them! And how much did the baker drink? LOL These look really good. I’d be tempted to try them using the dried fruit mix I use for my mini-fruitcakes (baked in tiny muffin tins). I can’t think off the top of my head, but there’s no candied fruit. It’s cherries, apricots, and all those other things soaked in bourbon for five days before you bake them.